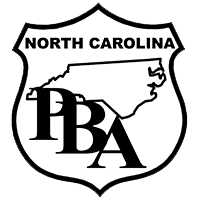 The North Carolina PBA is proud to announce the appointment of PBA leaders David Rose and Randy Byrd to the NC Criminal Justice Education and Training Standards Division. They were both sworn in on August 18, 2017, at the regular meeting of the Commission. Rose was appointed by Attorney General Josh Stein and will serve a three-year term. Byrd was appointed by Speaker of the House Tim Moore and will serve a two-year term. Rose serves as the Winston-Salem Chapter Triad President and sits on the Division Board. Byrd serves as the Cary Chapter President and NC Division President. Collectively, they have over 47 years of law enforcement experience between them. 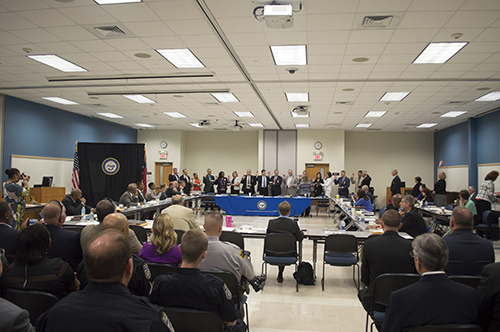 The NC Criminal Justice Education and Training Standards Commission establishes minimum employment, training, and retention standards for the State’s criminal justice officers. The Commission also plans for the effective implementation of innovations in the State’s system of criminal justice employment, training, and education. 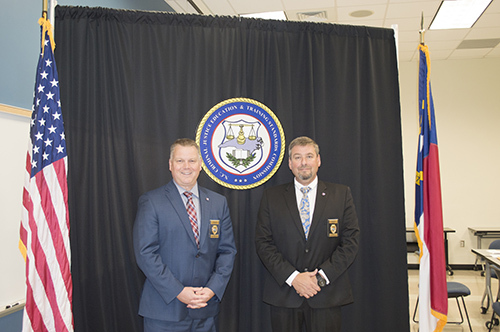 To ensure a consistent level of competency and professionalism among law enforcement officials, the Criminal Justice Standards Division administers the Commission’s mandatory certification and training programs. These programs cover all sworn police officers, correctional officers, probation/parole officers, juvenile justice officers and juvenile court counselors. The Commission has several committees that serve the full Commission. Rose will serve on the Education and Training committee. Byrd will serve on the Planning and Standards committee.